On December 4th, 2009, Fr. William Gaffney, CSsR will appear on the CatholicTV live talk show “This is the Day”. Father Gaffney is a Redemptorist Missionary priest engaged in parish mission work. Father Gaffney will discuss an upcoming Pilgrimage to France to celebrate the Year for Priests . The pilgrimage is open to all; however, one day will be set aside for a private retreat for clergy and seminarians which will be directed by the Rev. James A. Rafferty, S.T.L. 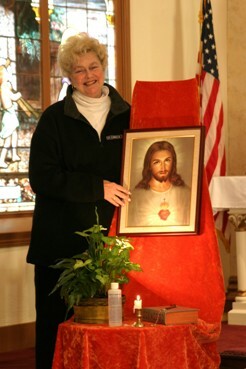 The pilgrimage takes place April 14 - 21, 2010. Pilgrims will travel to Ars, Paray-le-Monial, Lyon and Paris. Pilgrimage participants will visit Ars, the home of the simple curate of Ars, St. Jean Marie Vianney, the Patron Saint of Priests. The Sacred Heart Apostolate encourages the enthronement of the Sacred Heart of Jesus in homes, schools and parishes. It’s mission is to renew societies by centering families on the love of God incarnated in the Heart of Christ. The movement was founded by Fr. Mateo Crawley-Boevey, S.S. C.C. in Paray-le-Monial, France in 1907. It was endorsed by the Church as a global movement which continues to renew families on every continent for creating a civilization of love through the Enthronement of the Sacred Heart.